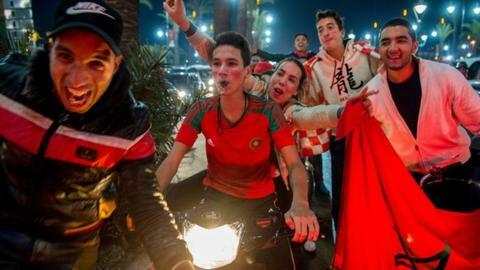 The chief executive of Morocco's 2026 World Cup bid, Hicham El Amrani, says his country is not bidding "for a communications stunt", but for victory. On Friday, Morocco must hand a bid book to Fifa outlining their plans for the tournament - as must the rival joint bid from Canada/Mexico/United States. "We are not here for a communications stunt - we are here to win," El Amrani told BBC Sport. Morocco are making their fifth bid to host the tournament. They have previously campaigned for the right to organise the 1994, 1998, 2006 and 2010 editions. Earlier this month, Morocco outlined the compact nature of its bid, in contrast to its rival's plans to span an entire continent. The bidders have until 1600 GMT on Friday to hand over their bid books, which will detail their plans to host the tournament - ranging from stadiums, training venues, hotels, transport to the environmental impact. Following the delivery of the bid books, a Task Force representing football's governing body will decide whether the bids are up to standard. Should any bid fail on a certain aspect, the bid can be eliminated. "We need to convince not only the congress, (but also) the technical team of Fifa," El Amrani said. If both bids succeed in impressing the Task Force, the remaining 207 member associations of Fifa will cast their vote for who will host the 2026 finals in Russia on 13 June. The 2026 World Cup will be the first to feature 48 teams after Fifa chose to expand the tournament last year. "You cannot bid for such a tournament, especially one that's been increased to 48 teams, without careful consideration - it is not a light decision," El Amrani, the former secretary-general of African football's ruling body Caf, added. "As you can imagine, in our kingdom, that's a decision supported by His Majesty the King so it makes sense to us to go for this World Cup." "I don't think we need to highlight the passion that we have for the game so for us, (bidding) combines all the important factors and provides joy and pride to our country." The sole previous occasion that Africa hosted the World Cup was when the tournament was staged in South Africa in 2010. El Amrani believes both his country and continent are ready to host football's flagship event once again. "We want to celebrate the world and receive people in our country, showcase the beauty of our country, its diversity and also boost the social, economic and human development of our country and the continent." On Thursday the rival bid, from USA, Canada and Mexico, revealed that there are 23 potential host cities within their bid, including NewYork/New Jersey, Los Angeles, Toronto and Mexico City. Seventeen of the cities are in the United States and three each are in Canada and Mexico.